Ideal for repairing cut or damaged galvanising. 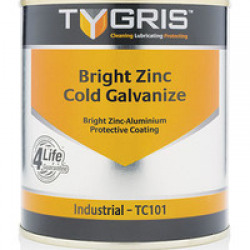 Tygris TC101 Bright Zinc Cold Galvanise is a fast drying anti-corrosive coating, suitable for use on both ferrous and non-ferrous metals. TC101 can be used as a primer and topcoat and ideal for repairs to cut or damaged galvanised surfaces. To order Bright Zinc Cold Galvanise please select the required product option below or call us on 01933 626225. Select an option below to add Bright Zinc Cold Galvanise to your shopping cart..